The 3.3 release marks the final work in the Kickstarter funded series. We'd like to offer a final resounding thank you to all our wonderful sponsors and supporters. The amount of work that has been achieved as a direct result of the funding is immense. We've added a huge amounts of new functionality, resolved nearly 2,000 tickets, and redesigned & refined large parts of the project. In order to continue driving REST framework forward, we'll shortly be announcing a new set of funding plans. Follow @_tomchristie to keep up to date with these announcements, and be among the first set of sign ups. We strongly believe that collaboratively funded software development yields outstanding results for a relatively low investment-per-head. If you or your company use REST framework commercially, then we would strongly urge you to participate in this latest funding drive, and help us continue to build an increasingly polished & professional product. 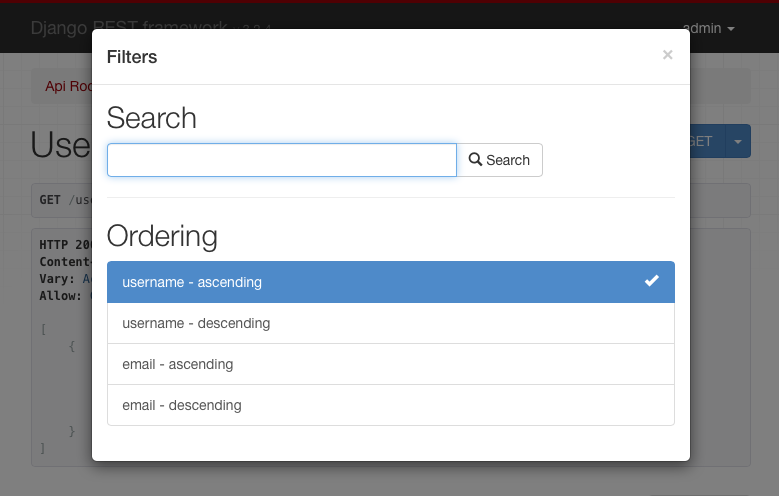 Filters presented as HTML controls in the browsable API. A forms API, allowing serializers to be rendered as HTML forms. A JSONField serializer field, corresponding to Django 1.9's Postgres JSONField model field. Browsable API support via AJAX, rather than server side request overloading. This release drops support for Django 1.5 and 1.6. Django 1.7, 1.8 or 1.9 are now required. The accept query parameter is no longer supported by the default content negotiation class. If you require it then you'll need to use a custom content negotiation class. The custom HTTP_X_HTTP_METHOD_OVERRIDE header is no longer supported by default. If you require it then you'll need to use custom middleware. The following pagination view attributes and settings have been moved into attributes on the pagination class since 3.1. Their usage was formerly deprecated, and has now been removed entirely, in line with the deprecation policy. view.paginate_by - Use paginator.page_size instead. view.page_query_param - Use paginator.page_query_param instead. view.paginate_by_param - Use paginator.page_size_query_param instead. view.max_paginate_by - Use paginator.max_page_size instead. settings.PAGINATE_BY - Use paginator.page_size instead. settings.PAGINATE_BY_PARAM - Use paginator.page_size_query_param instead. settings.MAX_PAGINATE_BY - Use paginator.max_page_size instead. The ModelSerializer and HyperlinkedModelSerializer classes should now include either a fields or exclude option, although the fields = '__all__' shortcut may be used. Failing to include either of these two options is currently pending deprecation, and will be removed entirely in the 3.5 release. This behavior brings ModelSerializer more closely in line with Django's ModelForm behavior.